Fantom Drives Xbox One Storage Hub comes with Seagate Firecuda SSHD (SSD+Hard Drive) 128MB cache. Firecuda is the fastest hard drive specially made for gaming. Upgrading your Xbox One couldn't be easier! Fantom Drives Xbox One Storage Hub is an easy snap on device that attaches to your Xbox One console and effortlessly upgrades your hard drive for Games & Media. 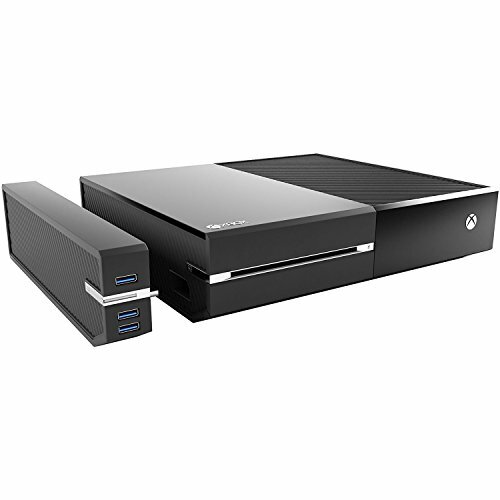 Our Xbox One Storage Hub has a built in 2TB Seagate SSHD and has 3 additional USB 3.0 ports for ADDITIONAL STORAGE (maximum 2 ports), controllers, or charging other USB devices. It also doesn't require any additional cords or power supply and is a clean seamless attachment to your Xbox One. We provide everything you need, you just have to snap on our Xbox One Storage Hub and get to gaming. Our quick installation guide provides A-Z directions on how to set up. By upgrading to a 2TB Seagate Firecuda which is built in our Xbox One Storage Hub, it enables users to download more games, store more data, and increase performance. NOTE: Xbox One is not included. NOTE: Xbox One is not included.